Following last year´s experience (link here), which I enjoyed very much, in this post I list the books I read along 2018 with a comment or two about them. Unfortunately, this year I did not manage to read as many books as in 2017, with 11 compared to 14 in 2017, but still the figure is better than two years ago, and almost a book per month. · Elon Musk (Jan). I started the year borrowing the book from sister Beatriz and I very much enjoyed it. I had written about Elon before (here) and I am a confessed admirer of what he has achieved and the purpose behind his enterprises. The book by Ashlee Vance provides good insight in his life and struggles, and how his companies work, not sparing interesting technical details on the developments of the famed Tesla electric cars and SpaceX rockets. I recommend it both for entrepreneurs and people working for large corporations and organizations. Still, after reading it (and somehow in line with my post about it) my conclusion would be: I would not work for him, but this world definitely needs more Elon Musks. · Brave New World (Jan). The classic by Aldous Huxley, this book is, along with Orwell´s Nineteen-Eighty-Four, one of the most important dystopias ever written. With a more positive tone than the somber Orwell´s release, it is incredible how, being written in 1931, it could foreseen the advent of mechanistic and consumption societies, the propaganda, and the tensions between freedom and order. Entertaining to read and eye-opener. · Last Expedition (Feb-Mar). The diary of Captain Scott in his quest for the South Pole between 1911 and 1912. Clearly not a master writer, and quite tedious in large passages, it is strange that this book was one of my highlights of the year. Apart from the controversy on whether Amundsen or Shackelton deserved more credit as explorers, the account day by day of the two years he spent in Antarctica builds up the tension to the final weeks until the death of his last crew and himself. I am still amazed how this person found words and moments to write as their friends were dying around him, keeping the discipline in such an extreme environment, until his very death. I really felt sadness reading those passages. A fantastic final account. · Capital and the common Good. (April) My yearly study of the work of Georgia Levenson-Keoane, second after Social Entrepreneurship. 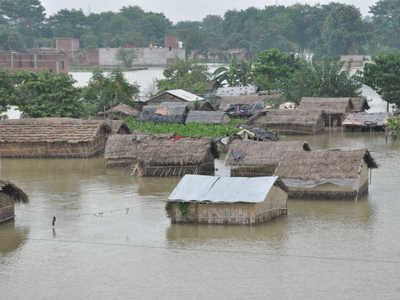 Almost text book quality with study cases on environment, health, financial inclusion and disaster relief. Important concepts such as risk pooling and sharing, alignment of incentives that can be applied to many aspects in life. The link to my review is at the beginning of this paragraph. I will keep studying and researching in this field. · Foundation´s Edge (Sept-Oct). Asimov´s continuation of his Foundation trilogy. I read again the spanish translation during my holiday trip to China. Entertaining and very easy to read, I finished it before even getting to the half of the tour. The development of the psyschohistory continues. However, to me, the surprise effect compared to that of the trilogy is not as strong and the array of characters not as complete. I will continue reading the Foundation series but will give some time before resuming with it. · The Picture of Dorian Grey (Oct-Nov). By Oscar Wilde. Maybe the most famous of the works of the irish writer. A thought provoking reflection on the limits of morality, with a narration in the edge of science fiction. I found it easy to read, enjoying the brilliant dialogues of the british victorian high society. Apart from the clever trick of the portrait ageing instead of young Mr Grey, I found much more interesting the character of Lord Henry. I discovered a challenger of the status quo, and the match that really fires this journey beyond political correctness. · Night (Dec). By Elie Wiesel. Last reading of the year, the mere 117 pages narration of Mr Wiesel´s passage in Auschwitz-Birkenau, Buna, and Buchenwald concentration camps, following deportation from Hungary in the end of World War II. With the stated purpose by the author to preserve the memory of what evil can do, I confronted this book with some fear of what I would read. After reading it I have mixed views. What I expected about the evil, in part a depiction of nazi tormenters, remains mostly absent in the narration. There are very few passages of torture or graphic violence, even if the monstrous Dr Mengele is mentioned in some chapters. The evil takes rather the form of the struggles of Mr Wiesel and the inner battle when compromising his most dear values (in regard with religion and compassion with others) for the sake of survival. Myself preferring visual works, I can think of Schindler´s List movie as a good example of a document with the same purpose of providing a vivid memory of that horror. However, one thing is unsurpassed: that text is autobiographic. The pain on those pages is just inimaginable. Never forget. And again, for a 2019 with as many readings. Credit to Jessica Ruscello on unsplash.com for the closing picture. “Mucha mili…” or in sort of an english translation “it´s the mileage…”. Mileage, experience, you name it…and above all, proper weather conditions. 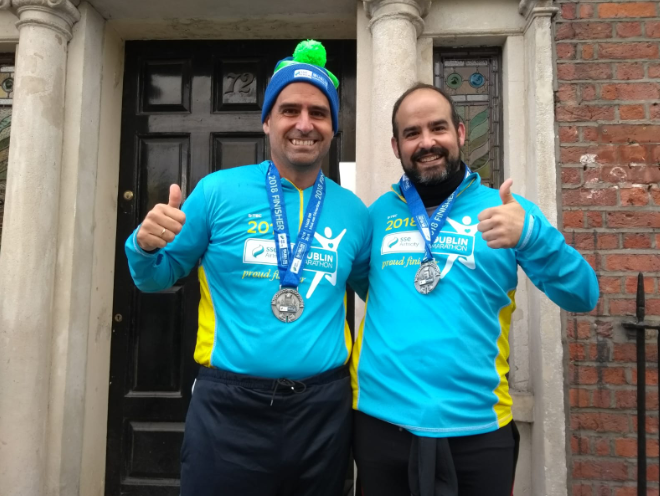 These were the main elements that contributed to the good sensations finishing the Dublin Marathon 2018 on October 28th. 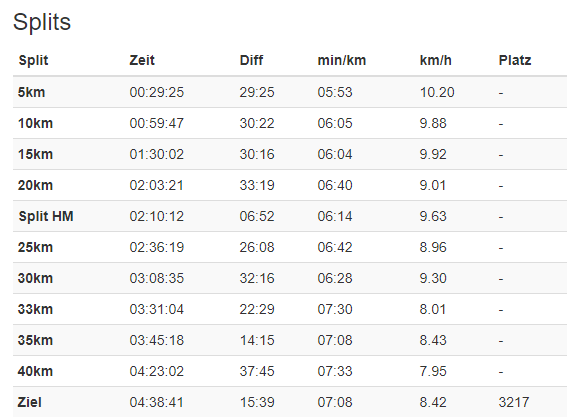 Talking numbers, I clocked officially 4h28’39”, which is good 10min faster than the spring race in Vienna (post here). Still, that is one hour slower than my best time ever, precisely some 10 years ago in my debut in the distance in Munich 2008 (link). The good sensations came somehow as a surprise because the prospects for the race were not good. Again a bumpy summer with workload peaks interfered in the training with the result of overweight as not seen in many participations before, and with the three week holiday trip to China just before the race. With the recent painful experience of Vienna, I intended to train better through the challenging sevillian summer. I know I would need to fight the high temperatures (above 35ºC at 11PM for entire weeks…) in the training sessions, but that compounded with the increased workload in my job and subsequent depletion of my energy reserves. The result of it: 48km run in August, 118km in September, and mere 58km in October, almost all of them during the holidays in China! I had completed that mileage alone in one month preparing for Lisboa the year before. Not worthy to speak of any series training, or long runs on weekends, none of which I was able to complete due to excesive heat, lack of fountains and a not proper preparation. I was preparing my mind for a participation similar to that of Paris Marathon in 2012, where after an injury and not having trained in the month ahead of the marathon, I traveled to the city not sure even to run. This time, I had at least the incentive to travel, apart than running along wiht brother Javier, to share time with his family, Luca and kids. Arrived at Dublin, we were welcomed by low temperatures, consistently below 10ºC. At least we would not suffer from heat as in Vienna. With low expectations and a couple of layers of clothes for the first kilometers, I set a modest pace at around 5’50″/km. 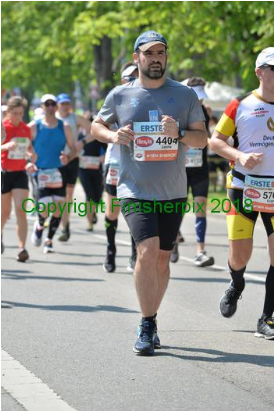 Soon I was caught by the 4h10′ pacers, who were speeding up at the beginning and I decided to join them, running comfortably in the range of 5’45” to 6’/km, and reach the half marathon. Then I expected to lose some pace and probably be caught by the 4h20′ pacers. That first half, without time pressure has been on of the best (not in terms of speed, of course) I remember, enjoying the cheerful Dublin crowds and the nice scenery of the city. I reminded me the first marathon loop of the Millau 100km. As expected, right after the half marathon milestone, the pacers left me, a slight increase in pace in a light uphill and I lost them. From km22 and for the next 10km I would be in the range of 6’20” to 6’35″/km, which would put me in the final 10km. A manageable distance, when you have already 13 marathon races behind, even if the famous “Wall” lies ahead. I slowed a bit the pace, made use of the power gels, installed myself in the range of 6’50” to 7’/km, cheering kids, enjoying music and I prepared for a final effort of 4 to 5km. I enjoyed the cheers of the volunteers and race staff and went to the baggage claim where I would meet Javier. He as well had had great sensations, going back under 4h, and improving his performance compared to Vienna. As I said at the beginning, a combination of weather and experience helped to completely turn the sensations of Vienna in the spring. To be fair, the difference was made by the cold temperatures and absence of sun. Having trained less and with a race course clearly more challenging than the austrian capital, the difference in temperature made it all for the better time record. Experience helped to set a modest pace in the first half, and regulate in the second, but this has been a quite clear demonstration of how my performance suffers with heat and sun. For the next marathon race, I will try to recover the levels of training of previous races and years, but I will know that if cold weather is present, I will probably have the odds on my side to come back under 4h. Another final comment is that with this race I recovered, last minute and at Javi´s urging, the tradition of tweeting a funny motive ahead of the race. Last original one had been for Millau in 2015, and I reused for Sevilla 2017 the same of 2015. Lisboa and Vienna went without any picture. 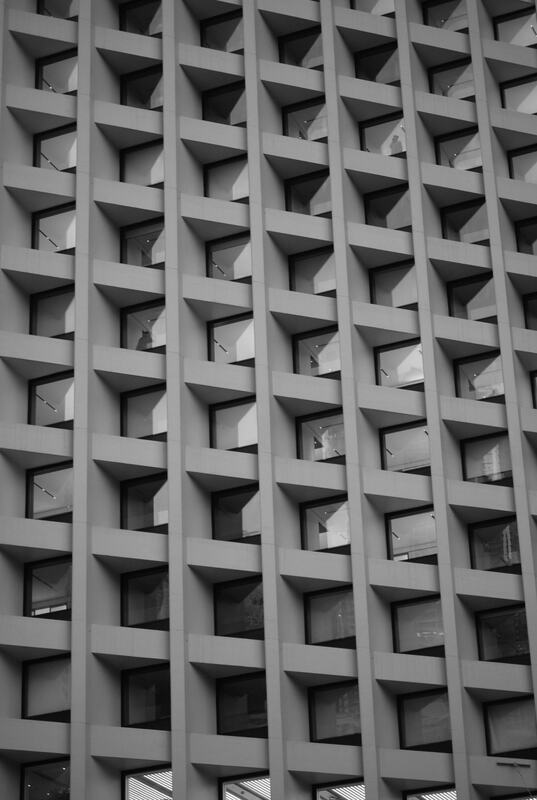 (Re)building a nation creates patterns. This post is an odd one among others in the blog. 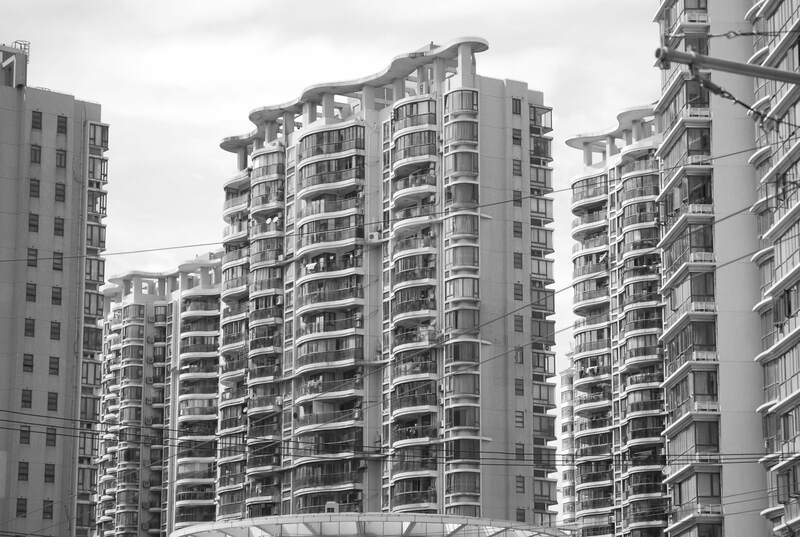 During my three week trip to China I could witness the result of the construction boom that the ancient nation is experiencing with intensity in the last decades. 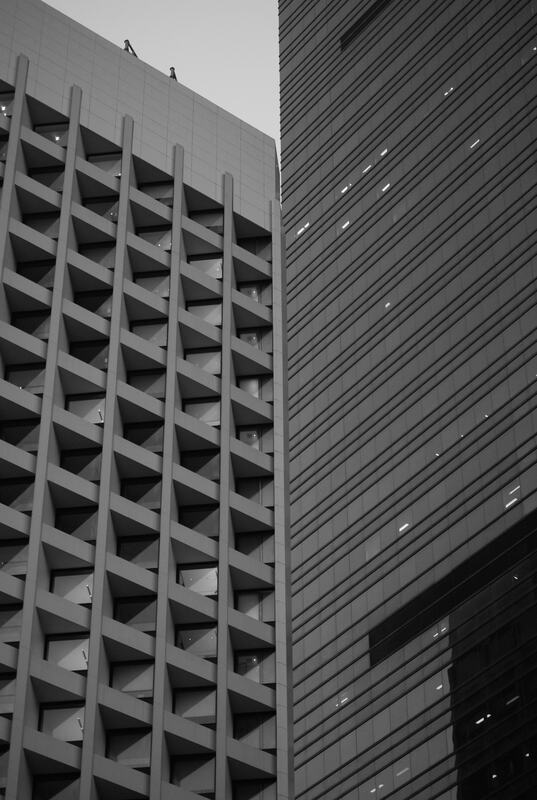 I always had some fascination for buildings (I selected Architecture as my third preferred option to pursue university studies, I finally picked Aerospace Engineering…) so the trip offered the chance to lay my eyes on the myriads of buildings across the cities I was visiting…and the patterns that they and their elements create. Barely mimicking the photo-posts of my friend Nacho (blog here) when he reports on a trip, I want to share just some of the pictures that I took of these hidden patterns that caught my attention. Most of them were taken selecting black&white mode in my Nikon D60 SLR camera except the last one, taken with a smartphone on the go, in my long way back from Hangzhou to take the train to Shanghai and then a flight to Europe. 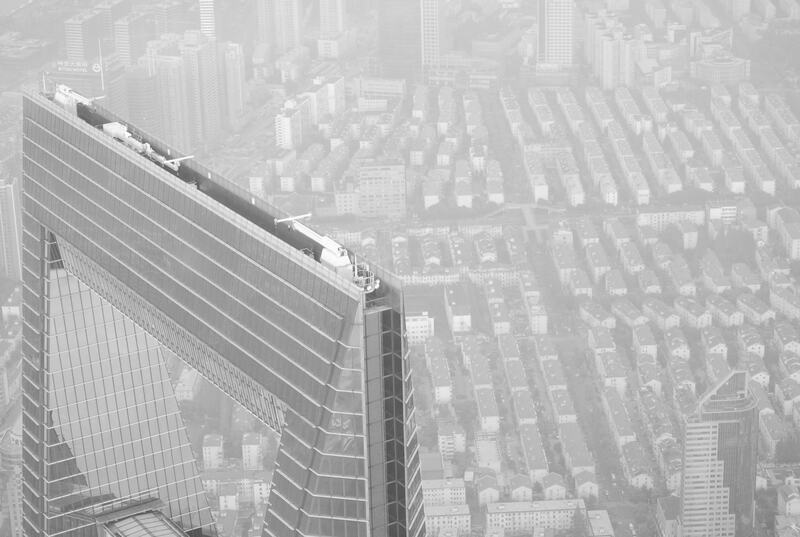 Shanghai World Financial Center with Laoshanxincun town behind, from Shanghai Tower observation deck. 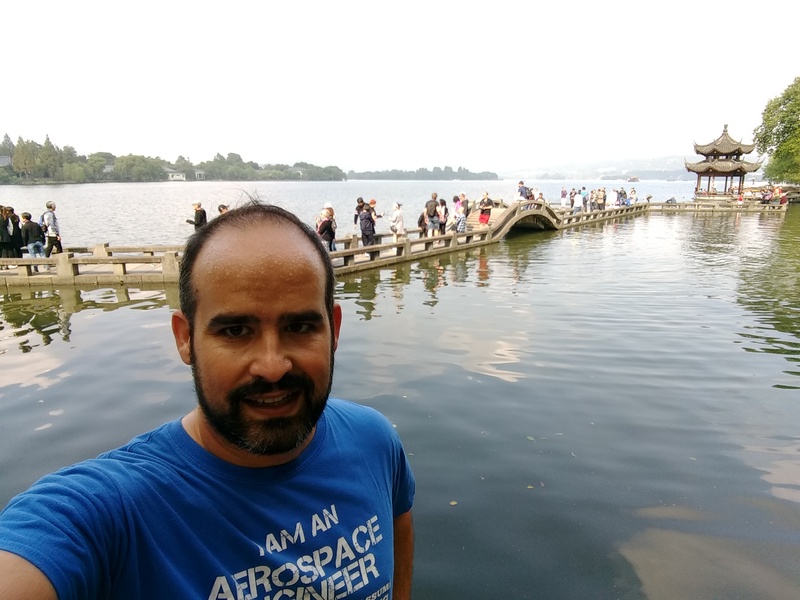 Clearly improving from the previous two trips (links to 2016 and 2017), the mileage run during this year´s three week holiday trip to China went up to 61,5km, in fact almost three times that of last year in the US and Mexico. Once again following the say “the running shoes, always in the suitcase“, I managed to run 6 days distances from 7 to 12km. Not only that, additional sport activities included the 70km cycling tour (in 4h30′) from Guilin to Xingpin along the beautiful river Li, and the 10km (also in 4h30′)hike in the Great Wall from Jankou to Mutianyu. 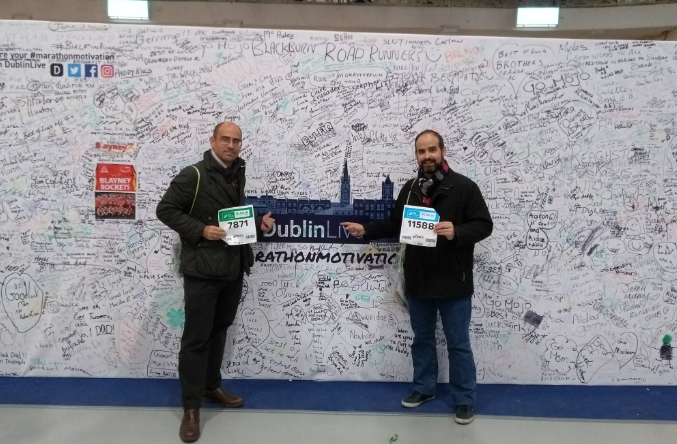 As in the case of last year, a marathon run loomed right after the trip (in Dublin, the week after writing this post to be precise), so there was an incentive to avoid ruining the meager training sessions of the previous weeks. 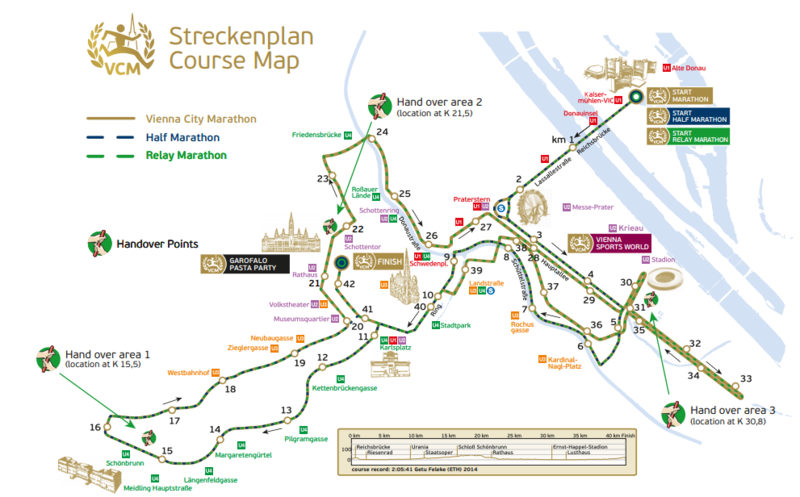 I will comment on the courses run and other remarkable aspects on each running spot. 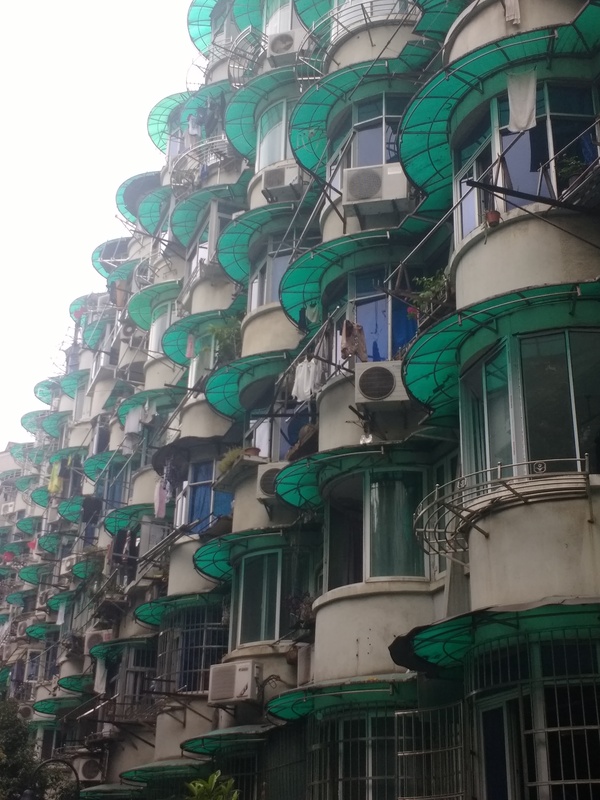 In the megacity at the mouth of the Yangtse River, I quickly spotted the riverwalk along The Bund, and beyond, as a candidate for a running course. 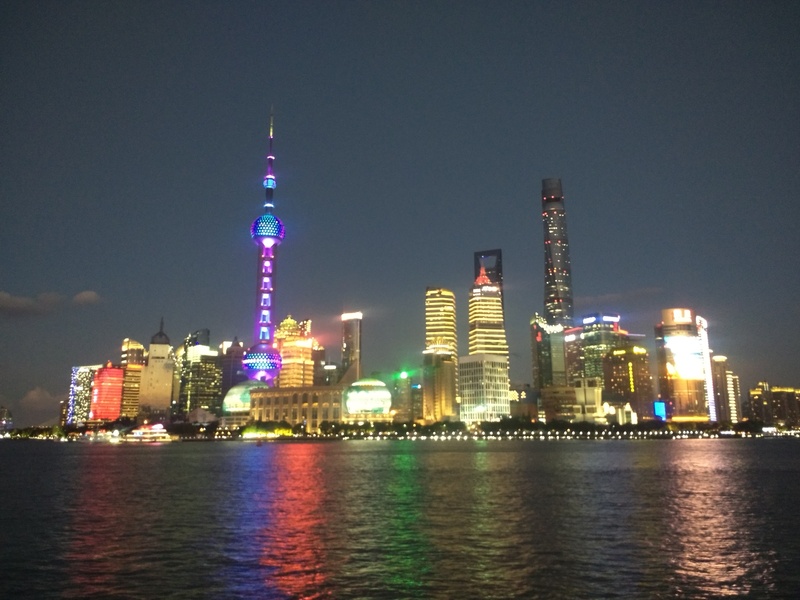 Even if those days the walk was one of the most crowded spots I have ever seen (it was chinese national holidays), the scenery with the Pudong skyline was inviting. And fortunately I discovered that some 3 kilometers south of the major sightseeing areas the crowds were more scattered. In fact, past the Nanpu Bridge, a fantastic course opened especially for runners, with a lane marked for that purpose, and another one for normal peasants. Running in the evening the first day was such a good experience that I repeated the following two days. Not only that. The lighting of the riverwalk was fantastic to see at night, revealing the money poured in this infrastructure. But what really struck me was the view of the skyline coming back from Nanpu bridge. Not especially the huge Shanghai Tower (with its astonishing 632m) but the myriad of tall apartment buildings to the south of it, all with different lights. The view, in combination with the lighting of leds in the floor of the riverwalk, was not from this world. It remains in my mind as one of the most impresive scenes ever seen. As you can imagine, in that spot I was not the only runner. Maybe more isolated in the packed crowds in The Bund, later in the running lanes south of the bridge I met many others, although most of them chinese. The paces of the three days ranged from 5’55″/km to 6’20″/km, for some 12km each day, totalling 36,4km. And below the view of the Pudong skyline at the entrance of the riverwalk. Again, not the most impressive sight for me. That was the one more or less marked in the map above with a black circle. After Shanghai I had three stops: one night in Shenzhen, a longer stay in Hong Kong, where I did not run, and the excursion to Guilin area, with the bike tour. It was not until Beijing that I run again. The day after hiking to and along the Great Wall sections of Jankou and Mutianyu, my legs, as expected, were aching. Nevertheless, the Houhai lakes near my hotel offered too good a spot not to run. This was a morning run on a Sunday, where already dozens of chinese tourists groups, hundreds of people, were already crowding the walks by the lakes. The northern part of them, however, were a bit emptier and I enjoyed a beautiful run. The other runners I met were rather old chinese doing as well morning runs. The fresh temperature helped to speed up the pace, to 5’46″/km for a total of 7,5km. Below a couple of pictures I took, one on the evening before, while drawing the main lake, and the other with the crossroads, marked with the black circle in the picture above. 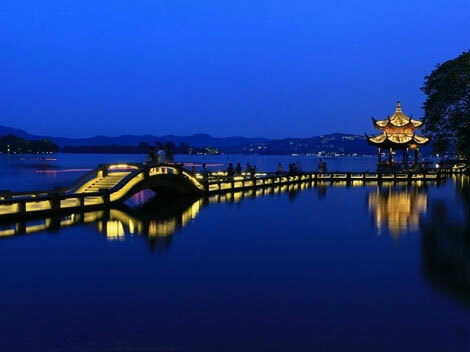 Last stage of the trip was the Silk Road city of Hangzhou. There I stayed at a hostel close to the legendary West Lake, a spot that inspired poets and emperors for centuries if not millenia. The beauty of its shores was inviting and I run on the evening of the 16th and the morning of the 17th before packing and leaving to take my plane back to Spain. The town around the West Lake being a spot for tourism since long ago, it was not unusual to find runners eager to enjoy the nicely arranged walks. I met many of them both in the evening and in the morning. In fact, this was the spot were I found most of them, and a couple of them quite fast I must say. The paces were 5’41″/km for 7,6km in the evening, and 5’36″/km for 10km the next morning. In the evening run I did not take pictures, but the scenery with the pagodas and walkways illuminated were almost beyond words. In the next morning I took the one below, corresponding the the spot marked with the circle in the map above. I was happy to have covered so many kilometers along the trip, even if they do not account for proper training just a couple of weeks before a marathon run. Anyway, they were way more than the amount expected looking at the precedents. 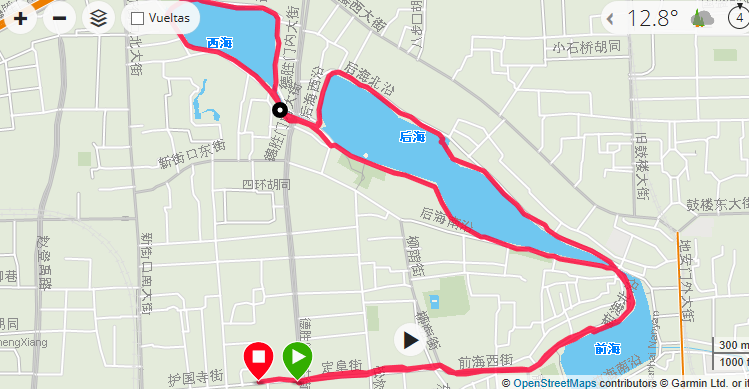 And the spots in which I run, especially in Shanghai and Hangzhou, were magical and impressive. In combination with the bike tour and the Great Wall hike, this rounded possibly my most sportive holiday trip ever. 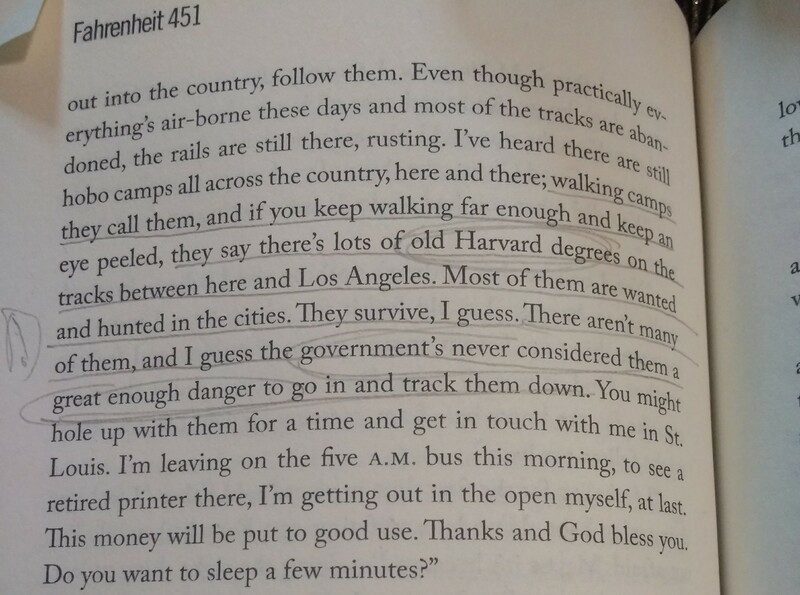 It reinforced the overall overwhelming impression the the country left on me. Will I be able to repeat the same in next long trip? Who knows, until then, the next step will be to report on how these 62km contributed to the Dublin Marathon preparation. Not long after the discovery of the book Social Enterpreneurship for the 21st Century by Georgia Levenson-Kehoane, I decided to read more of her research and recently got her latest release Capital and the Common Good. Based on the first one I had written some notes (link here) incorporating much of the internet links to the resources and organizations discussed in the book. And I summarized my understanding of the main teachings. For this new release I will do a bit differently. Its content is more structured around four main topics than the first one and covers a wider range of the world´s problems (in contrast to the somewhat narrower focus of Social Enterpreneurship…). I will summarize the main chapters with some comments on them. 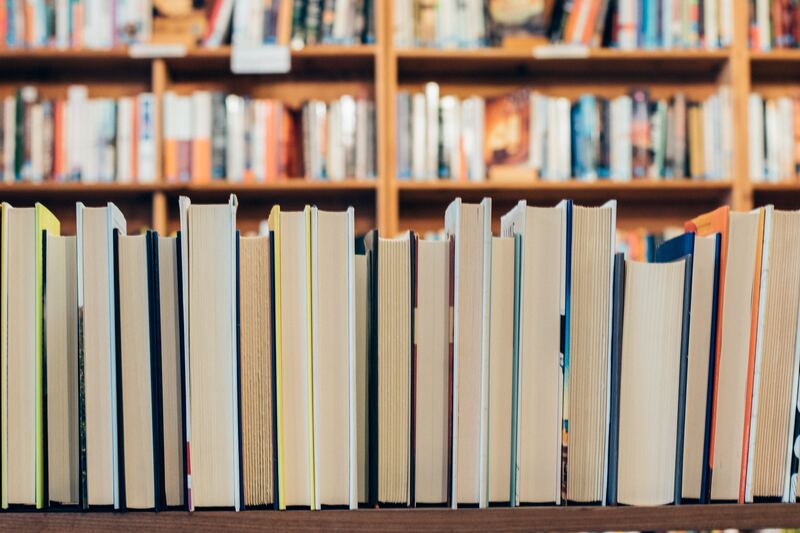 Underpinning the book is the discussion of the concepts of alignment of incentives, risk and time management, trust building, and how they relate in order to device financial structures that help to solve relevant problems. This is revealed through the case studies described in each chapter, both of successful and failing initiatives and projects. The four main chapters cover following themes: Environment, Health, Financial Inclusion and Disaster Relief. A final chapter overarches with different examples the situations in the US related to the mentioned topics. Environment: The chapter discusses the value of the environment as a public good to be preserved, the negative externalities (i.e. those agents not bearing the costs of polluting/harming it…) and discusses cases of projects to protect it. For example the Pay-for-success approach within the REDD initiative, aimed at reducing the emissions from deforestation, and where norwegian funds managed by local brazilian institutions helped successful conservation projects in the Amazon area. Further financial mechanisms are discussed in the chapter, in particular the so-called green bonds, where the interest is repaid from revenues generated by environmental projects. Such bonds in theory offer hedging against climate problems. 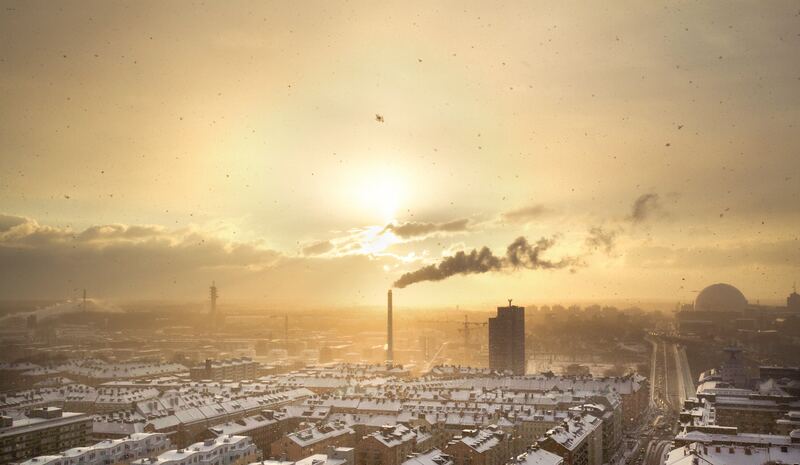 Cap-and-trade redistribution strategies are also commented, in which externalities are put a price that can be traded by actors in the filed. The examples of fishing industry or building development, where high rise buildings generate tradeable revenue to invest in compensating infrastructures around them. Health: mechanisms are discussed to help the building of trust, the exchange of information and the sharing and lowering of risks to finance the costs of health needs. Again the pay-for-success scheme is shown, with the case of Global Fund, where the interest is paid out of the avoidance of future health costs.. Other strategies are mentioned such as the use of taxes and levies, for instance, those applied to some operations in a country such as selling of flight tickets, where an fraction of the price is destined to cover health costs. Further examples are the “sin” taxes imposed on products such as tobacco, in order to alleviate the budgetary burden that they impose on the health system of a country. Two more axis of actions are presented. The use of Advance Market Commitments is one, as in the case of GAVI initiative for the procurement of vaccines, that helps secure and stabilize future revenues for the manufacturers, thus reducing risk and cost. Other line of action is the management of debt relief for countries that pledge prevention programs. One example would be the case of the IFFIm, or International Financing Facility for Immunization, where upfront and immediate costs to purchase health resources are made available backed by the securitization of the mentioned pledges. 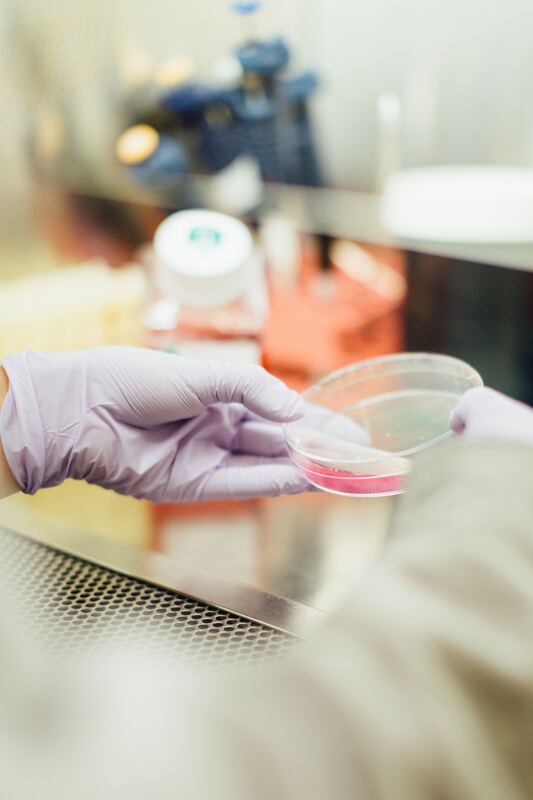 Smaller projects are also mentioned such us MedStartr, for funding of medical projects, Kangu, especialized in birth assistance or Healthfundr, similar to Medstartr but focused on venture capital that provides impact. Most of the schemes and structures discussed in the chapter revolve around the concepts of pooling risks of individual initiatives, stabilization of revenue streams, and building trust to lower the concerns of mismanagement, corruption, governance of problems of scale. Financial inclusion: This chapter discusses cases around the world of access to capital and financial services in developing countries and regions. 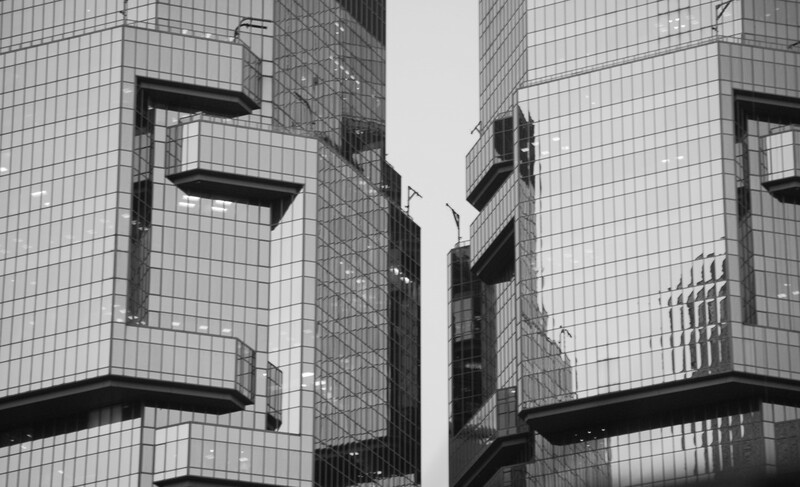 Technology enables there financial services via cell phones, and progressively the provision of insurance which, in such regions is sometimes even more important that the finance itself. 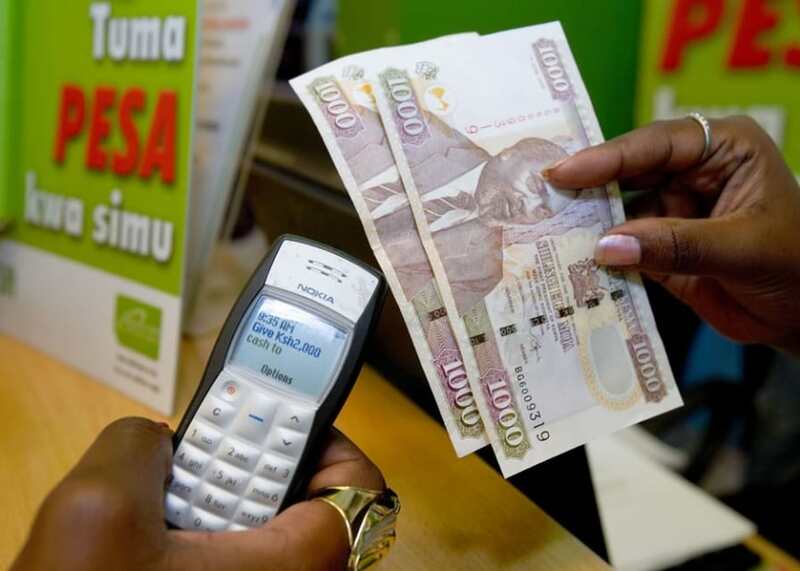 The application cases of M-Pesa money transfer system are discussed for Kenya, where it is a success, and Indonesia, where the results are not that satisfactory. Regulation aspects are factored in the discussion. Comment is made that, even if not all cases and projects work as well as intended, the successful ones serve as demonstrators to attract and unlock international funds into underdeveloped areas. Disaster Relief: The chapter discusses from natural disasters (rainfall, droughts,…) and the impact at local level to wars and refugee crisis. At local level again the examples of micro-insurance are mentioned (M-Pesa), where the technology-enabled systems helps with the early pay-outs for the recovery as well as the acquisition of on-site data and the measurement of the natural phenomena (floods, etc…). 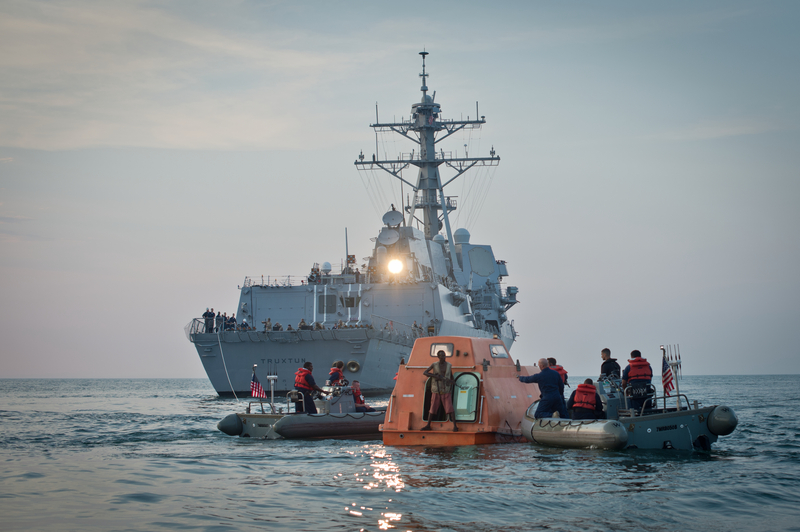 The disaster relief discussion jumps to the regional and national levels with the cases of the Cat-bonds (for catastrophe bonds) used after the Sandy storm in New York city or the Katrina hurricane in Louisiana in the US. Other example, at transnational level is the African Risk Capacity, which helps by pooling non-correlated risks across different countries, lowering costs and focusing on preparedness and early warning and payments. Most of the cases discussed around disaster relief again revolve around accurate measuring and data gathering to help with response time and upfront money availability. The chapter closes with discussion of the blending of development initiatives with humanitarian efforts to help refugees and migrants. That is, man-made disasters such as wars. Mention is made to some solutions to avoid the influence of mafias in the money transfers to refugees, i.e. by means of vouchers. The case of Lebanon is discussed as an example of the blend of development and humanitarian effort and Al-Majmoua micro-finance services as one local operator in that field. The final chapter is a summary of initiatives and solutions with focus on the United States. The concepts developed along the book (tech enabled solutions, pooling of risks, measurement, trust,…) are reviewed with more examples. These concepts help to deal with problems of discrimination in communities, to develop local based (i.e. housing, education) and people based solutions (i.e. transport, jobs), again with examples, such as The Social Entrepreneurs Fund, or the NYC MTA ticket vouchers just to name a few. 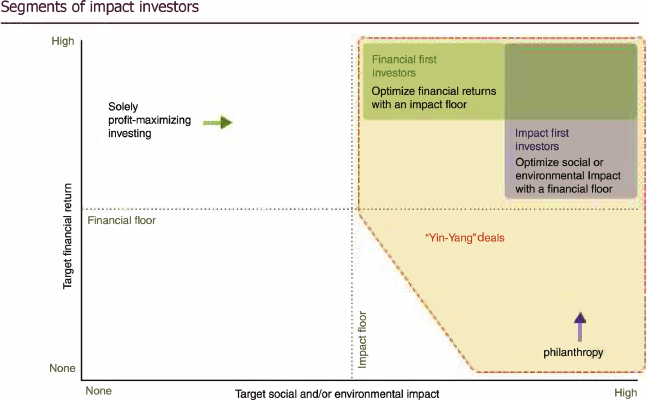 A broader discussion in that chapter is focused on the Social Impact Bonds. A financial mechanism already mentioned in the previous book, now pros and cons are brought up. The main problems of execution and complexity of its set up are described with the example of the Rikers Island Correctional facility, in New York, where the rehabilitation projects financed via SIBs were not successful. The Rikers project tried to replicate another SIB project for correctional institutions in Peterborough, UK, but cultural and demographic differences, the judicial system and a slow set-up and implementation revealed that often there is no one-fits-all solution. 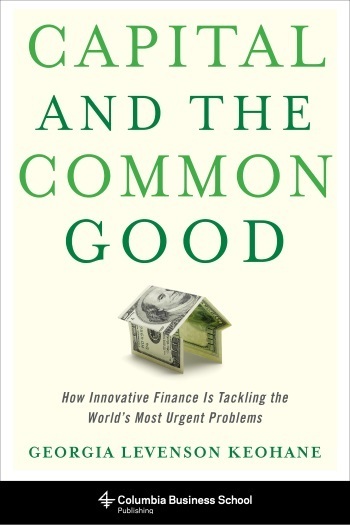 I have to say the same as in the previous notes to social innovation in finance, which is that the book is rich in material to be reviewed, including the large notes sections at the end. It has almost text book quality. For my engineering mind, though, I would have liked some more structure among and within the chapters and sections. In fact, these notes are, as many posts in this blog, a personal exercise to structure and better learn what I have read. Also in this sense, some more visuals and graphics would round the book up. Anyhow, I found another door-opener in Capital and The Common Good. It has helped me a lot to deepen in the understanding and discovery of social finance and innovation, to discover new names and institutions active in every field, and nurtured my interest on the possibilities of financial instruments to help solve the problems of the world. I encourage every reader to go beyond these notes and explore the two books from which they derive. 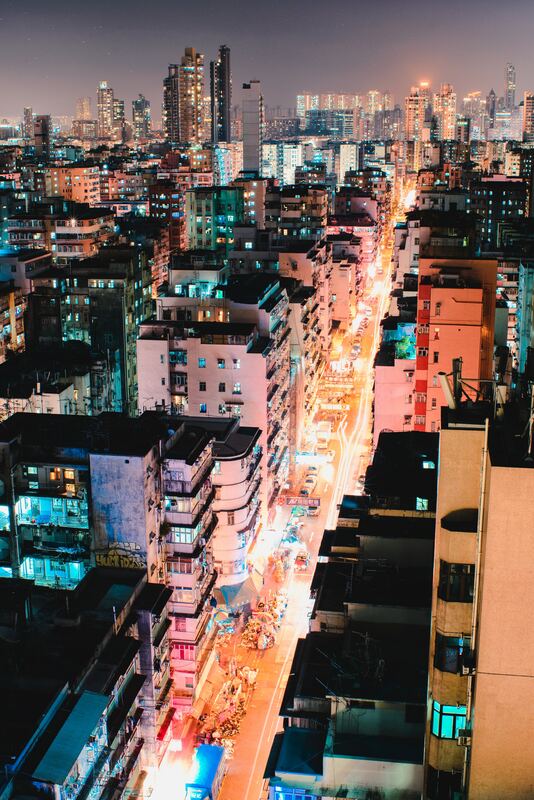 Photo credits to: Karsten Würth, Petter rudvall, Drew Hays and Jesus in Taiwan on unsplash.com, Times of India and Afritorial. 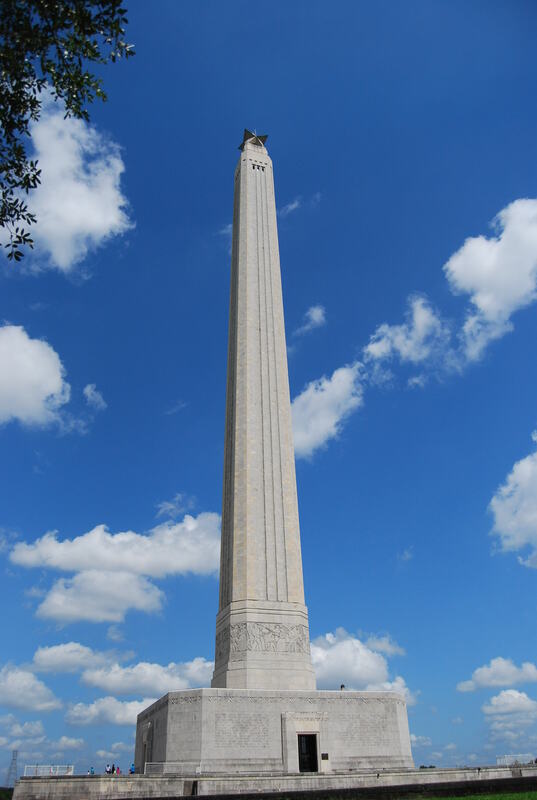 Following the visits to NASA sites during my vacation trip to the US in 2017 (link here), which had ended in Houston, I had on the agenda the San Jacinto Battlefield Monument. There Sam Houston had defeated the mexican army of general Santa Anna. I had recently read about the famous US Senator that gives name to the city in John F. Kennedy´s book Profiles in Courage. The stay in Houston would thereby be nicely rounded up. The monument site is centered around an impressive obelisque of almost 174m high (570ft) located in the battlefield. 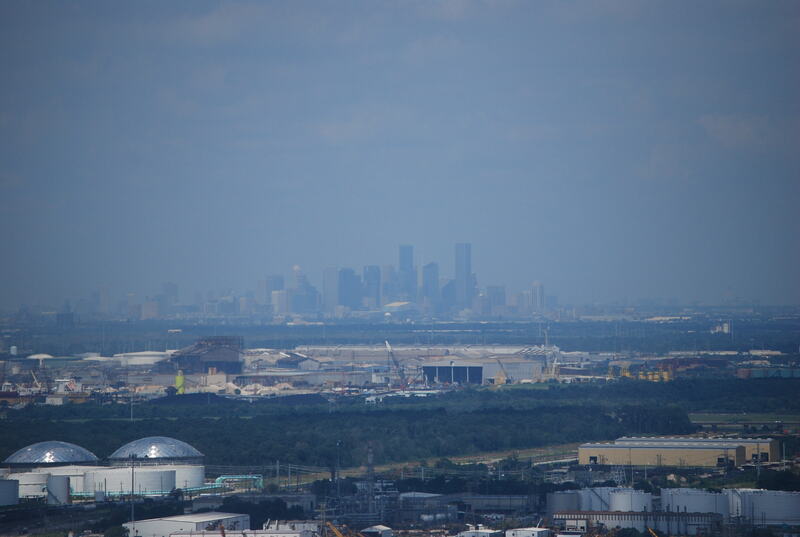 The obelisque has an observation deck on the top with great views on city of Houston and the entire bayou, with the unending oil refineries and fields surrounding it. At the basement there is a museum with an outstanding exhibition full of explanations of state history, from the 16th century spanish dominance (including analysis of the colonial social structures at the time! 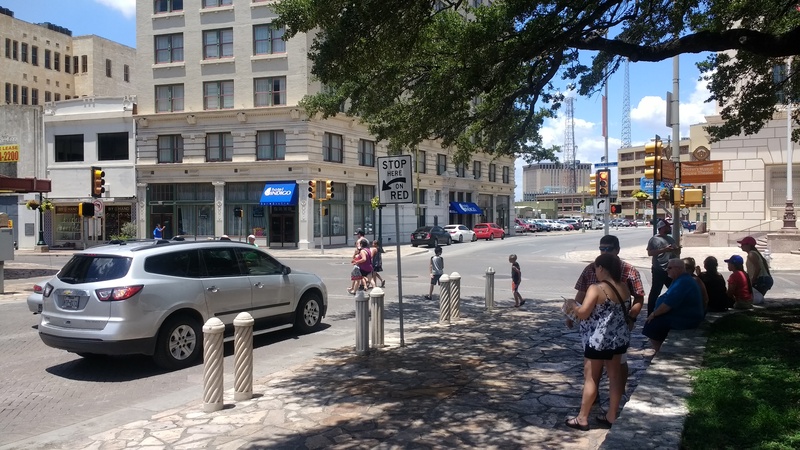 ), through the spanish-mexican war to the texan independence war that unfolded after the battle there. Reading the banners in the exhibition, and as I was reminded and suggested by a texan couple, San Jacinto had been in fact a revenge from Sam Houston to the mexicans, and the proper chronological visit to be done was the one to The Alamo mission, in the city of San Antonio, a three hours drive from Houston. 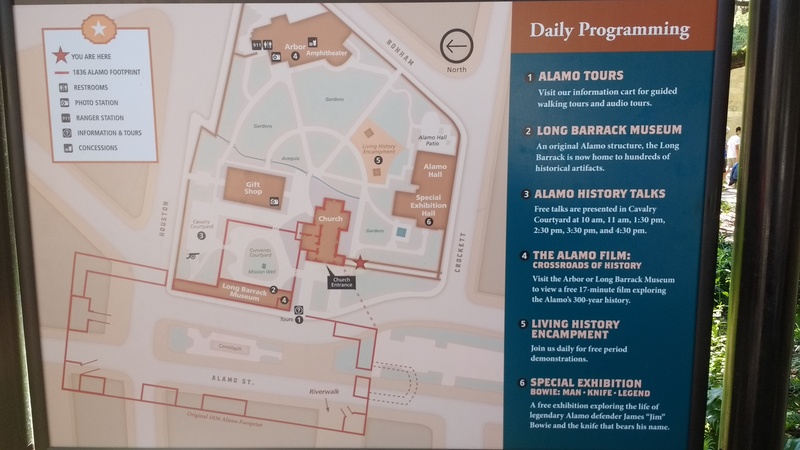 To summarize the notes shown above, the site served missionary and military objectives during the spanish rule from 1716, then mexican and finally the texan fighters who rebelled against the regime of General Santa Anna from 1835 to 1836. 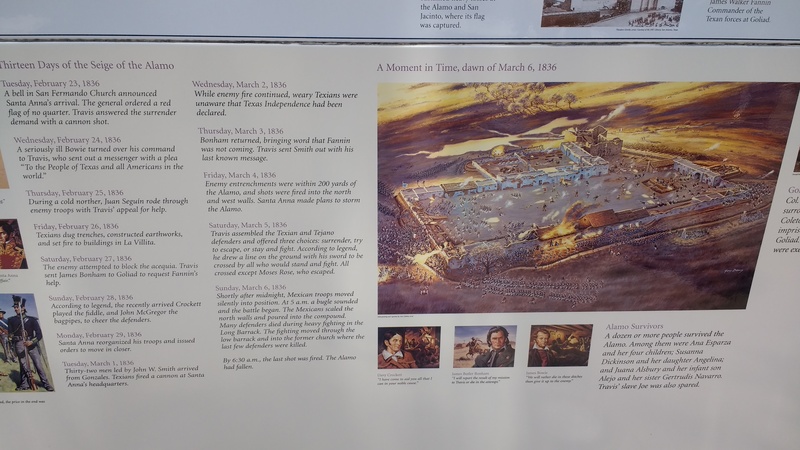 The history of The Alamo goes down to the agonic resistance and defeat after 13 days of siege from February 23rd to the morning of March 6th of 1836, where the final charge of Santa Anna broke the lines of the mission and the last post in the church was surrendered. The resistance is associated to the names of its texan commanders, immortal to today´s americans, such as Bonham, Travis and above all Jim Bowie (1) and the legendary Davy Crockett. 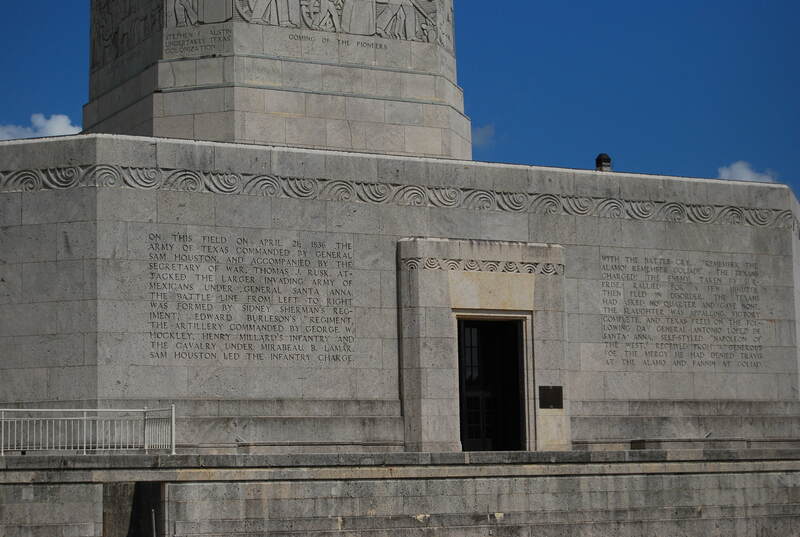 Even if the result was a defeat, it went down in history as an example of bravery and valor for the texans like no other, as the myriads of books, songs and movies have registered along the decades. 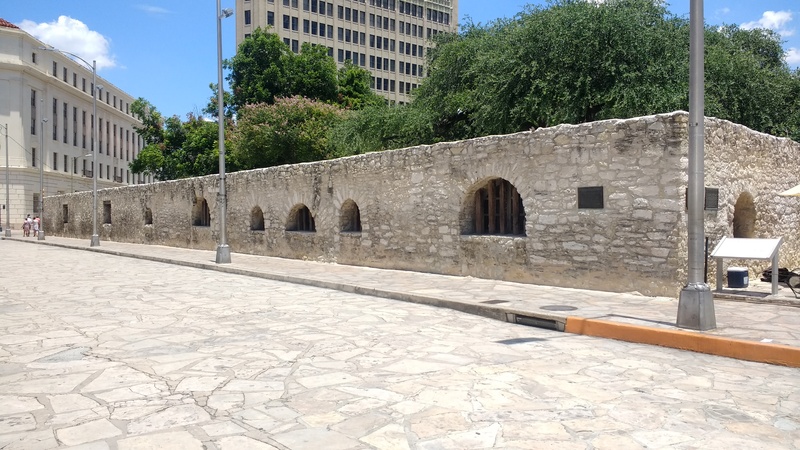 Now, chronologically, it can be understood that San Jacinto was the revenge months later for The Alamo, and it paved the way to the texan annexation and to a series of victories against the mexicans that unfolded in the US-Mexican war from 1846 to 1848 (2). This in turn resulted in the acquisition by the US of California, Arizona, New Mexico and parts of Nevada, Colorado and Utah. As explained in the museum of the Long Barrack, these battles and subsequent territorial expansions really gave the US a continental dimension, with its shores in both oceans, and ushered an unprecendented era of growth in many fronts. 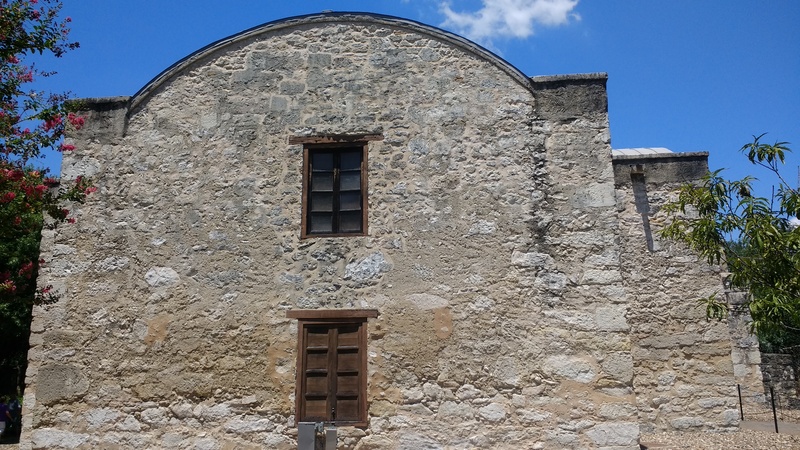 (1) Today´s The Alamo complex hosts a dedicated exhibition to the figure of Jim Bowie and his famous knives. The exhibition struck me a lot. 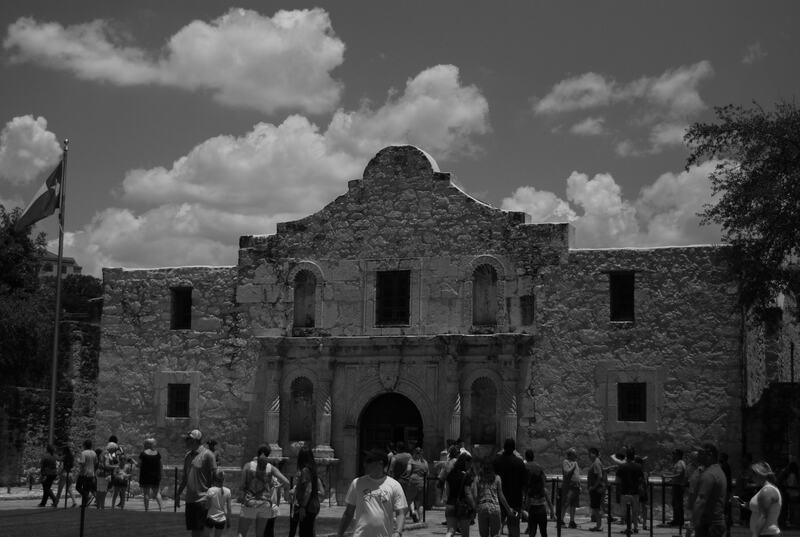 Bowie was a personal envoy from then senator Sam Houston to The Alamo in order to help hold the post. But the information provided in the museum speaks of a controversial individual, practically an outlaw who had killed commercial rivals with the knife that became famous, and who was known for fraudulent practices with land deals, and used to sell slaves as well. By today´s standards no politician would like to be linked to such a man, but it seems that those were brutal times, and Sam Houston seemed to have found in him “a man for the job”. (2) My journey on that trip after Houston continued to Mexico, where I had the opportunity to read the mexican side of the history of that war in the museum of Chapultepec Castle, where a similar shrine to their particular resistant fighters, the “Niños Heroes“, is located. I will post in the future about that visit to Mexico. Almost same story but with different perspective. 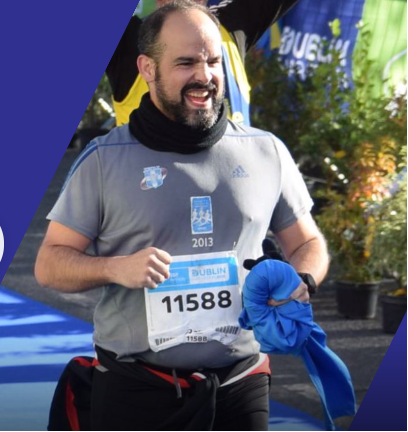 With a finishing netto time of 4h 38’41” , my new second worst time ever after Paris 2012 and surpassing Seville 2017, struggling already in km 11 and a lot of suffering from km 27, this post seemed posed to reproduce the feelings I had after the mentioned Sevilla race. It is not. 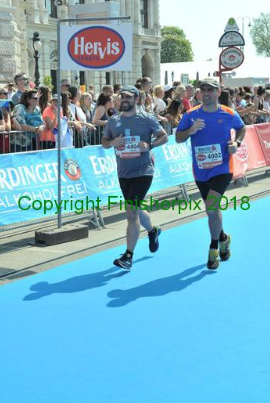 In hindsight it was a great experience, after all this was my 13th marathon race since I started with the distance in Munich 2008. And although my statement from Seville saying “don´t ever fool with a marathon race” remains valid, it is not that we fooled with the race. The fact is that the distance always reminds us that it is unforgiving. On the preparation, based on the good finishing experience of Lisboa I tried to follow the same training/recovery plan of that race. An intensive plan for some 250km spread in 6 weeks including long runs on weekends and speed series on weekdays. Even though I was again not able to balance correctly work and training especially in March, I finally covered more than 90% of the mileage, getting similar good sensations than those for Lisboa. Also the same psycological incentive of the whatsapp group for training, reporting and peer motivation was used with Javier, and it worked similarly. Already in Vienna, the weather forecasts (sunny and around 25ºC) prepared us for a battle as we had experienced, for instance, in the “greek inferno” in Athens 2013. As in that race, our particular field included the same three out of the 4 J´s, Juan, my brother Javier and myself. Javier had managed to book a small but well located room in the city center, close to the finish line and metro station to get to the start, and that allowed us to enjoy tourist walks without effort. However, my sensation is that we did not manage to sleep well in the night before the race and definitely did not have breakfast properly. We had missed the closure time of a nearby supermarket (in order to buy fruit, coffee, …) on Saturday evening and had to go with the products of hotel reception vending machines. 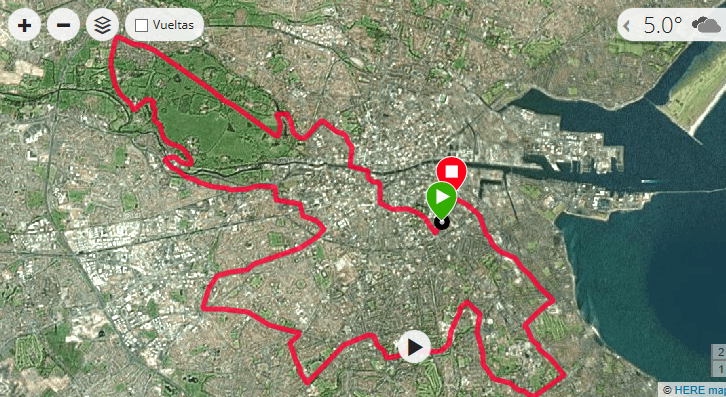 The race started quite ok and I kept a conservative pace ranging from 5’50″/km to 6’/km, mimicking the strategy of Lisboa. The heat and the sun started to indicate struggle ahead. The shades of the trees in the Prater Park offered some coverage, and the prospect of future alleviation for the kms 27 to 35 according to the course map. Not bad. After getting out of the Prater Park around km 6 to 7, the first streets and avenues showed us the impact of the sun. I had it difficult to manage the heat, and the pace suffered, being consistently over 6’/km. The road to Schönbrunn Palace started to be painful, a bit uphill and with the heat and sun, in spite of the undoubtful beauty of the viennese streets and avenues. For the occasion the soundtrack was full of classical music works matching the city´s history. Down from Schönbrunn, and having reached the half marathon, the buildings offered some protection against the sun, but I was suffering already probably from the unproper breakfast, even though I tried to recover with the bananas provided in the water stations. In these, the water was supplied in small hard plastic glasses, less practical that the paper ones or the bottles, and I needed to slow down or stop in order to drink and not spill the content, as I do with the fountains during the training sessions in Seville. That would be then the mental relief: a long typical Sunday run with stops to drink. 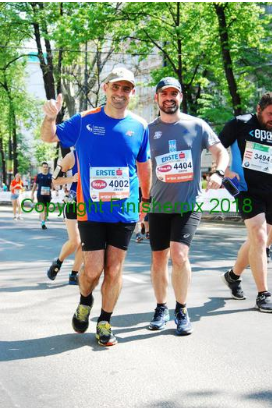 Reaching km 28, back in Prater Park, I was suffering a lot and some 2 km later Javier caught me (he had stopped in some parts of the course for the toilets…) and we decided to run together as we did in Madrid 2015. The next 8 kms would run again under the trees and that helped me a lot in order not to stop. The pace exploded anyway, up to 7’30″/km in some moments. The we left the Park behind and were exposed anew to the sun in the wide avenues of the city center. However, with around 3 kms remanining the last effort could be made. 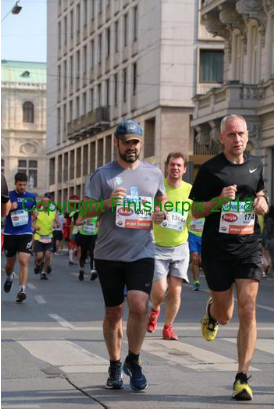 We sped up a bit below 7’/km and crossed the finish line together as we had done in Madrid three years before. After finishing, while we were exchanging clothes and eating the refreshments from the finisher bags, we saw next to us a runner that was being attended from exhaustion or heat by the Red Cross. I had seen similar scenes throughout the race course in numbers like in no other marathon before that I can remember, which gives an idea of the challenge. Almost recovered, we shared the feeling about how great this distance of the marathon is, that had almost beaten us, how unforgiving to the slightest failure. Anyhow, we had managed to finish it, what is always an achievement. With Juan, that came to finish a while after us, we almost set us up for the next one in the fall season, most probably Dublin. One thing is sure, regardless of the training and pre-race conditions that we will try to control better, for sure we will again pay respect to the 42km and will be happy if we finish. 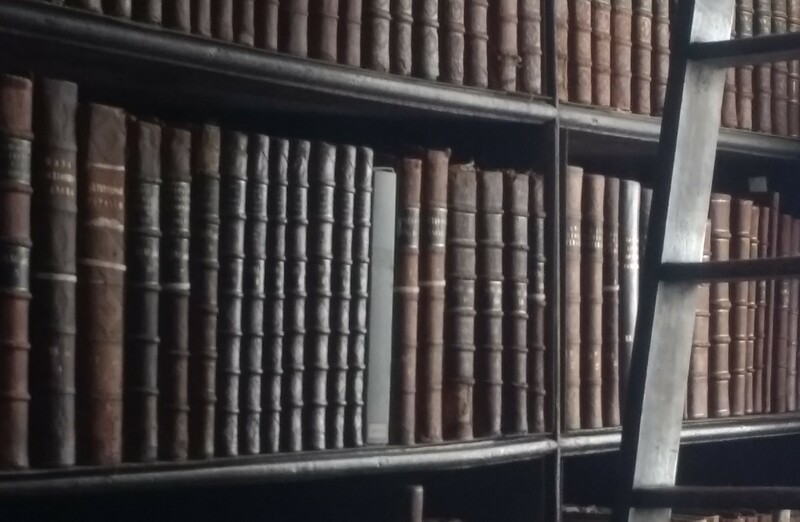 I have reported in some articles in this blog that one of the most satisfying things about researching and writing on the charities I fund is the intellectual exercise of expanding the knowledge about them, and of course sharing that information publicly. 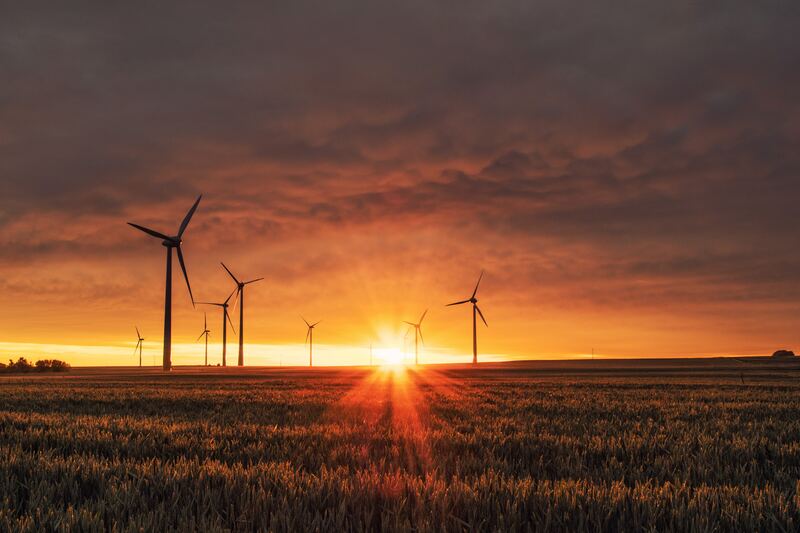 Well, as the title above indicates, following up on a post I wrote about Socially Responsible Investment (SRI), these notes extend that exercise of researching and sharing to that field. A sequence of events lead to that. Since the article about SRI, written in 2014, I had started building a small portfolio of stocks mirroring part of the investing principles of the Triodos Bank Funds. The portfolio, apart from growing (compounded 30% in value since), led me to follow related financial institutions in twitter. In particular I happened to read about Trillum Asset Management. As a disclaimer, I have to say that I hold no relation to Trillium (their minimum equitiy range is way beyond my possibilities) nor do I want to recommend investing with them. But the fact is that I found a lot of materials made available on their website. For those readers interested in SRI and ESG principles I especially recommend the following resources to be found on their White papers sections, where extensive information can be found on fossil fuel free investments, shareholder activism or gender issues, among other SRI topics. For what I wrote in 2014, these documents provide relevant study cases. Most happy chance was that, investigating about the team behind Trillum I came across an interview to Georgia Levenson Kehoane, and the books she had written on SRI matters. I bought one, Socially Entrepreneurship for the 21st Century, which I finished last year. In a nutshell, the book is a good reference to do a quick dive in this field. It is structured in four main parts. The first two provide the bunch of technical concepts and information in relation to non-profit and private entrepreneurship, which I will further comment below. The third part deals with study cases and examples of american public administration, in particular New York City public policy experiences and the Obama administration. The final part, called Room for Debate, cleverly points out the most relevant topics in discussion. I want to share some comments on that as well. In the first two sections of the book I read about quite a few new names and concepts. · Organizations/foundations. Description is provided on the activities of some organizations that hold hybrid structures to fund and finance small for-profit initiatives and non-profit projects, such as Omidyar or Google.org . Others provide long term funding and resources for social enterprises, like Acumen (especially with its online courses at plusacumen) or Root Capital do. The concept of Patient Capital is introduced, meaning investments with longer horizons and lower-than-market rates of return, which helps to work on areas where the markets have usually failed. · Use of Prizes. These can be used to give incentive to achieve an array of socially relevant objectives as participation (to educate or change behaviors), networking (to strengthen communities), exposition (to best practices, to influence perception) or to provide technical solutions (for well identified problems or to create underserved markets). Some examples of the last category are discussed such as InnoCentive (i.e. partnering with NASA as I have seen recently while writing for my posts), or the well known X-prizes, where the famed Peter Diamandis is a driving force. · Valuation and measurement. Maybe the most relevant contribution from the business realm to the social impact initiatives is the intensive use of measurement techniques and disciplines. The book describes some of them: the basic cost-effectiveness analysis, or benefit-to-cost ratios (BCR), also calculating the Net Present Value (NPV) of an action through time; the use of Randomized Control Trials (RCT) for development projects; or the Social-Return on Investment (SROI), which, for instance, helps to assess the savings in public spending driven by an action in a given time frame. 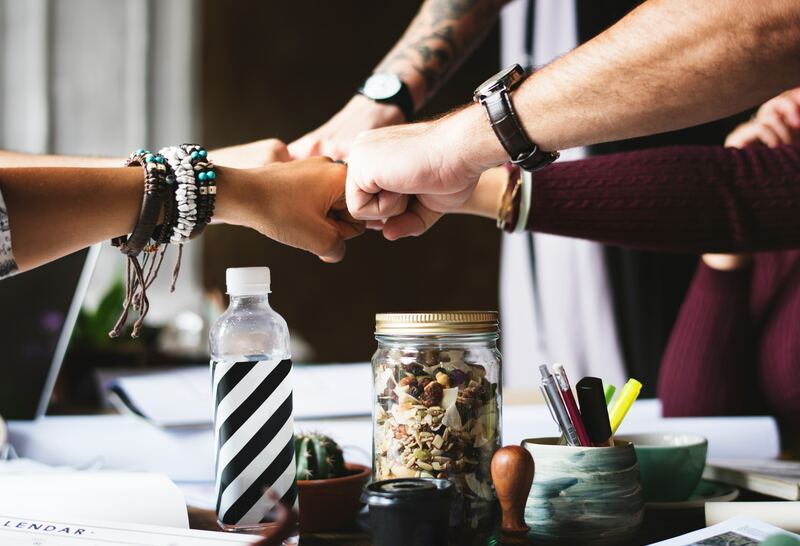 These methodologies suit differently depending on the projects and to apply them may be beyond the resources of small organizations and individuals. In order to solve this, some measurement online resources are listed in the book such as GuideStar, with lots of searching capabilities, applications for platforms, and papers, all resources both in free registration and paid versions. Other is GiveWell, which provides metrics based on cost-effectiveness, in addition their “own mistakes” section is just humbling and worth reading. Also interesting in this regard are the many cases presented in AdmittingFailure. · Impact investing: among the different strategies of the SRI, one of the most relevants is impact investing, which is discussed in the book. It calls for intentionality, that is “explicit intention of having a positive social or environmental impact”, defining the impact rather in long term benefits such as employment creation in underdeveloped areas. A second axis to impact investment is the weight conceded to the financial return that makes attractive the investment in relation to the intentionality, even when operating where market failure exists. The book cites the Monitor Insitute (now a unit of consultancy Deloitte) as a reference to assess this balance. The diagram below helps to categorize the actors that serve with different degrees on both areas. And some names that operate in the top right corner cited are investment companies with focus on impact such as ResponsAbility (with funds with typical “patient capital” rates of return and good visuals on the “impact” concepts), Blue Orchard (also with “patient capital” funds offering and educational resources) or their “peer” Bamboo Finance, in similar fashion than the previously mentioned Acumen, among others. · Investment measurement: in addition to discussing the investment actors, the book lists a range of resources focused as well on providing tools and relevant metrics to measure social impact “for-profit” investments and companies. Among them the most known being: B-Lab and its platform for rating corporations (“B-Corp” accreditation) and the resources of B-Analytics with its GIIRS metrics and funds; and the other, Global Impact Investment Nework (GIIN), also a subscription platform with databases, services and tools such as ImpactBase or its IRIS metrics. For example, one debate focus on the risk of confusing markets and market-building tools as ends and not means to achieve social impact. The case of the microcredits in India, with the battle of Grameen Bank founder Muhammad Yunus and the SKS Microfinance, much more commercially oriented, is a good example and has a dedicated chapter in the book. Another debate circles around the power and influence of wealthy actors in the field. Titling “The Gates Effect”, a section discusses the malaria disease, with Bill Gates as one of the most relevant proponents and funders of the eradication efforts, as opposed to the disease containment, believed to be more cost-effective by other organizations. That the World Health Organization policy leaned towards eradication is taken as an example of the “halo” effect of such super-donors. Other cases discuss the political bias of the actions of philanthropists, again opposing the axis of action of the “liberal” Gates to the conservative Koch family. 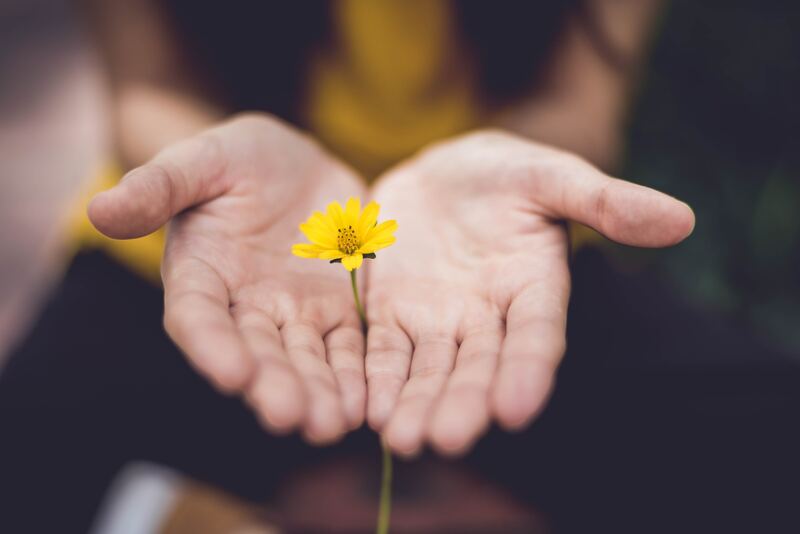 As indicated in the title of the post, these notes are a personal follow up of my learning process of the theory and practice of social investing. I have a lot to thank to Georgia´s book on opening my eyes to many new names and resources. To be noted however, is that being published in 2013, the book it is not fully capturing the impact on social innovation of the most recent developments around big data, the ways to collect such data with sensors and to extract value with machine learning and artificial intelligence. His tweet links to an article, published in the Stanford Social Innovation Review, precisely on the developing uses of big data. The writer´s organization, Planet, has a line of action in social impact of big data, that I am starting to explore. Thanks to the tweet and the article, I have also discovered Stanford University Center for Social Innovation, with its ImpactCompass. That is, new resources and organizations dealing with social impact that will keep me learning and posting on the topic. Some two and a half years after my visit to London, where I had a great experience visiting the HMS Belfast museum ship (post here), the 2017 summer trip to visit my sister Beatriz in Norfolk, in the US state of Virginia, offered the chance to expand the knowledge and visits to naval warfare. 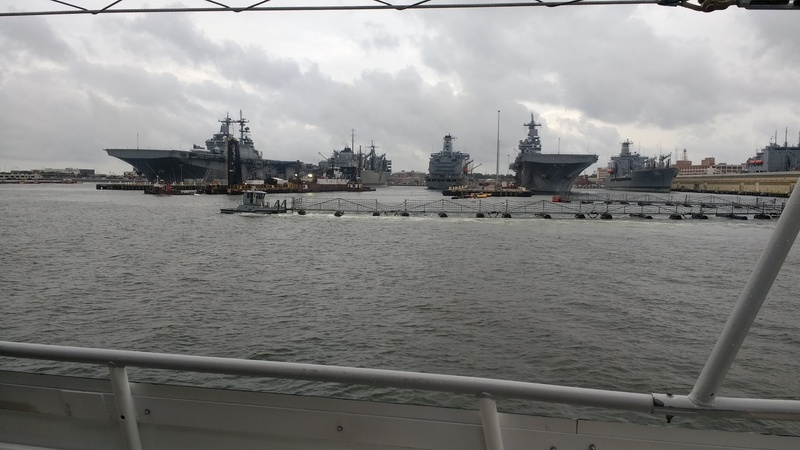 After all, Norfolk is home to the world´s largest naval station and it is where the US NATO headquarters are located. 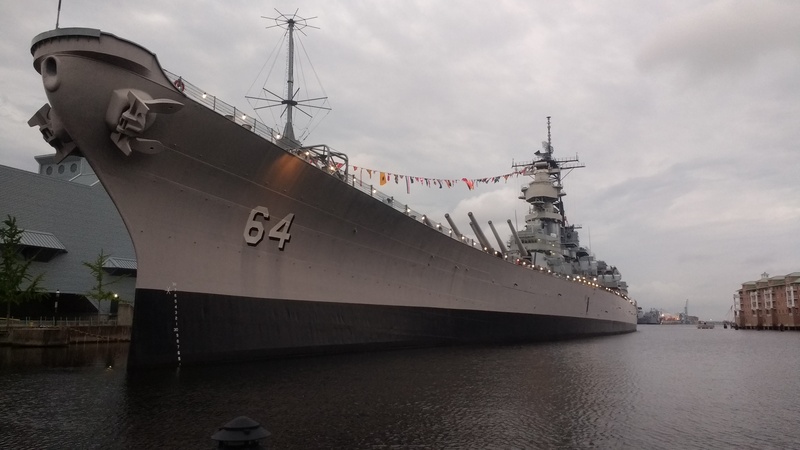 The city of Norfolk, strategically located at the mouth of the Chesapeake Bay, has long naval tradition and thus hosts an interesting naval museum, the Nauticus, with the USS Wisconsin battleship in display. 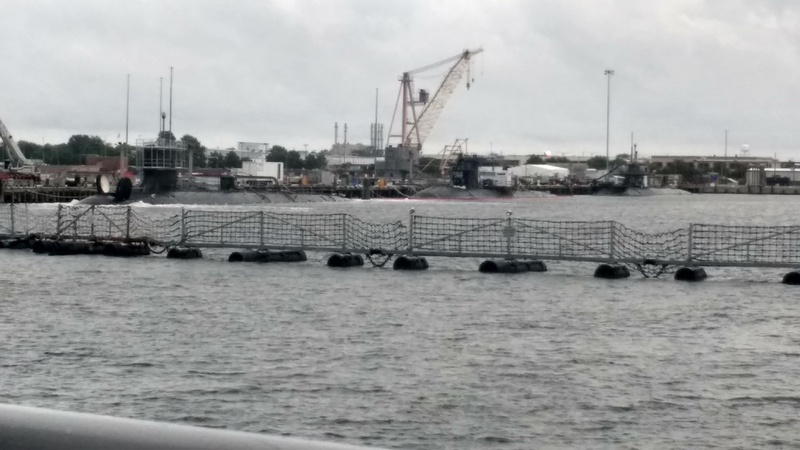 In this post I will share some pictures and comments of the visits to the Wisconsin and the boat tour I took with Beatriz to the Naval station. 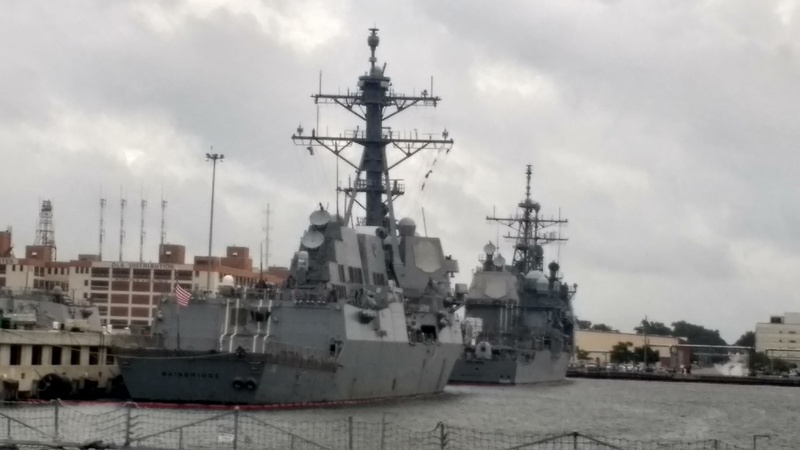 After having a great meal at the Waterfront restaurants with Beatriz, a quick and nice stop in the VisitNorfolk info center yielded free entrances to the Nauticus and USS Wisconsin for us, the friendly spaniards. The tour guide to the Wisconsin not being as detailed as that of the HMS Belfast, the vessel is considerable bigger being a battleship (some 270m compared to the 187m of the Belfast) and more modern, being commissioned five years later, in 1944. 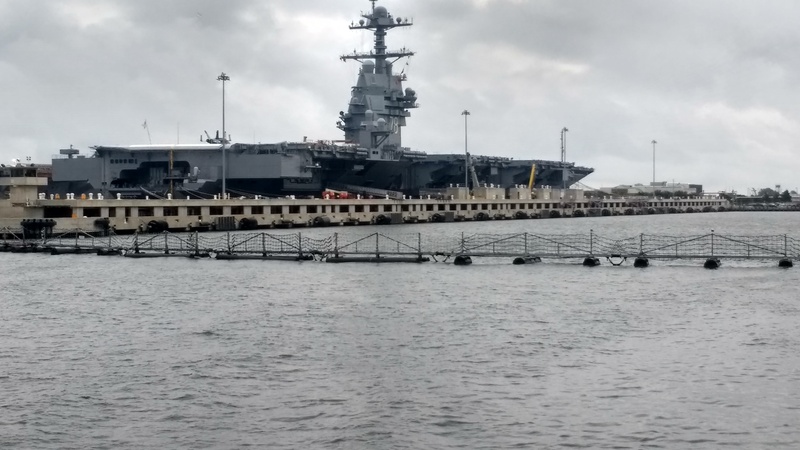 After the visit to the Wisconsin, I joined Beatriz to get aboard a boat tour of around 2 hours along the Naval Station that can be booked directly at the Nauticus. Even though the weather was not accompaining, with light rain that got heavier at times, the tour yielded impressive sights. Beatriz and I enjoyed it a lot, and definitely recommend it to anyone visiting the area. 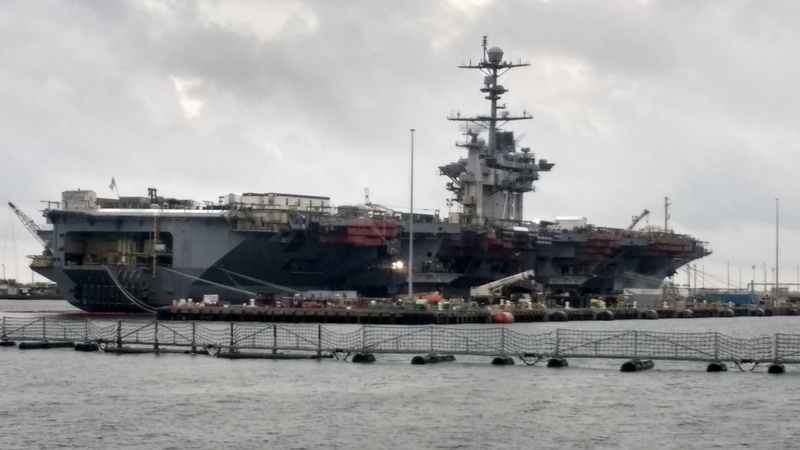 Note the naval version of an F-18 on the deck for the tests. 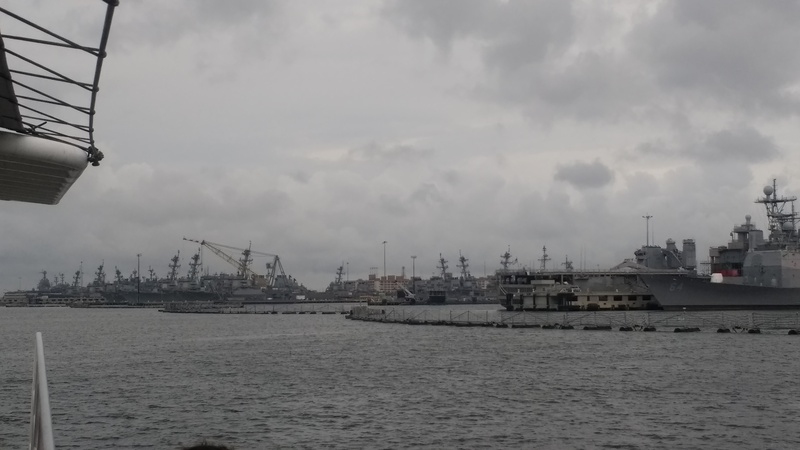 The tour continued back to the Norfolk harbour showing from the distance the enormous Newport News shipyards, where the carriers and most of the submarines for the US Navy are built. This enclave of Virginia is not a particularly touristic one. I had the incentive to visit it because the internship of my sister Beatriz. 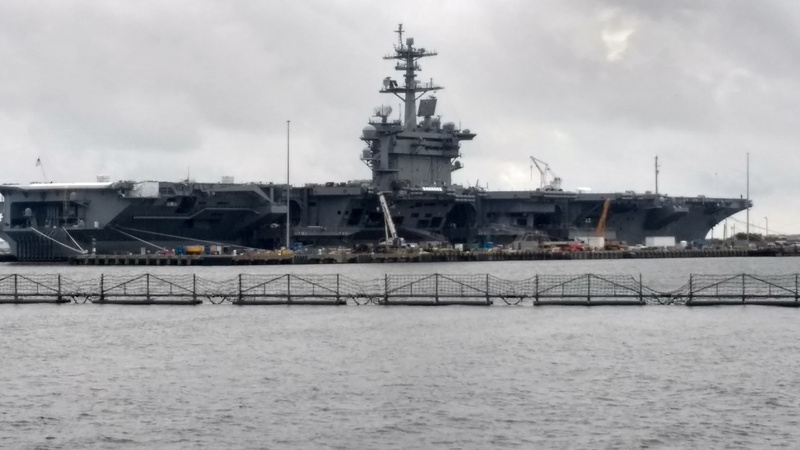 Then, I discovered the beautiful coastal side of the state, full of history, and had the chance to had a glimpse of the naval power of the US. At some 3 hours a car ride from Washington DC, it is not then usual tourist trip, but if the reader has the chance to go there, be sure that she will be impressed. …in this blog. Discontinued in the Christmas Holidays of 2016, this post retakes the comments on the blog stats that I did in the two previous years. Some general comments before going to the rankings. In 2017 I managed to publish 12 posts in this blog (excluding this article), two more than in previous 2016 when I published 10. 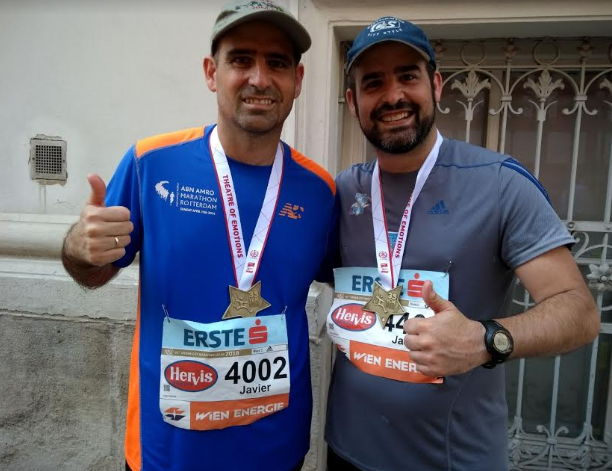 This may come as a result of a better work-life balance this year, in which I could read significantly more (as indicated in the previous post) and sort of got back on track with long distance running, again participating in two marathon races as I used to do before moving to Seville. However, it is to be noted that none, I repeat, none of the articles published this year made it to the 5 five most read in the year (in fact not even one from 2016). Only “Failure is not an option…” got to place 10th. And also noticeable is the fact that “Notes on car…”, written back in 2014 remains, for third year in a row, by far the most read article. Conscious of this fact, already last year I updated the post to included a quick survey at the end of it to know about why and how readers came to it. Even if I got not answer to the survey, the info from WordPress indicated that many of the clicks to the post came from a “moodle” e-learning server from the Oakland University in Michigan, close to Detroit, which offers programs on automotive engineering, including aerodynamics. I like to think that this is thus indicating that the post may have some value to students in that university majoring in car aerodynamics. The stated purpose of the article would then be fulfilled. As you can see, all top five articles are related to the technical topics most addressed in the blog, the series of aerodynamics articles, and book reviews and posts on x-planes and prototype aircraft. Even if written in past years, they keep attracting readers. Whether it is due to a better tagging of theses articles or a true interest of readers on this topics, I still cannot tell. Regarding the least read articles during 2017, 4 out of the last 5 are posts written in 2014. So, even if not very much read, it is a good thing that they raised some interest some three years later. It is also a good sign that all the articles written this year enjoyed a larger readership than these five listed above. Finally, beyond these stats, still a good deal of my experiences of the year went without proper reporting in this blog, which they truly deserve (i.e. more highlights of my trip to the US, the start-up competition experience in Seville, and some others…). These, along with other posts dedicated to more book reviews, or follow-ups to topics such as electric propulsion and social investing, still form part of the article backlog that hopefully will see the light in 2018. Alone the exercise of researching about topics, organizing the information and drafting the posts, remains a stimulating intellectual activity and one of the main reasons to keep a blog active. Inviting every reader of this post to become also a writer, and expecting then to read from you, see you in these lines in 2018.